Theodore Finch constantly fantasises about dying, especially his death. Standing on the ledge of the school tower, he's surprised to find Violet Markey on the other side. Their brief encounter leads Finch to pair himself up with Violet for a school project. As they discover the wonders around them, Finch and Violet find that they can rely on each other to heal and grow. But as Violet begins to let go of her grief and fears, Finch is slowly slipping away from the world. Trigger warnings: suicide, depression, abuse. 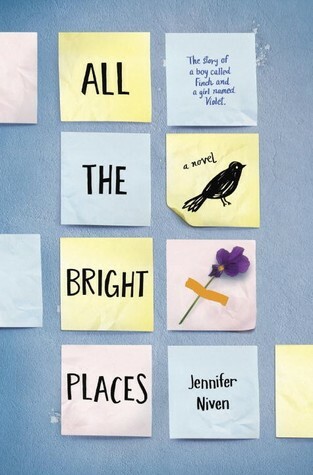 All The Bright Places has to be the most hyped book for this year, at least so far. After constantly hearing rave reviews about it I decided to give it a chance. Unfortunately, it's now part of the most over-hyped books I've ever read. The first half of the novel is quite light, which did seem to trivialise the read for me a little but made it easy to ease into the plot. The characters are introduced and whilst I liked Finch right off the bat, the same can't be said for Violet. In fact I wasn't particularly fond of her character at all. I sympathised with her situation, particularly with her conflict between enjoying life and grieving for her sister. However, the wall that she builds to push everyone away falls abruptly. I didn't really think that was realistic, and whilst it's not a total reverse in character, it did feel like it was too easy and sudden. I did liked that at the end though, at Violet tried hard to be strong for bother Finch and her sake and that she found positivity in the worst situation. It really drives the message that there is always help and support from the people around you, in both times of happiness and suffering. Finch was a witty and intelligent, both of which he used in his banter towards Violet - something I really enjoyed from their relationship. He is a very realistic character and Niven does a great job conveying the emotions of a person going through a mental disorder. There are glimpses of his "problem" at the beginning and the mystery behind it pushed me to keep reading. But even right at the end there is no explicit or further explanation to what was being alluded. I eventually understood his situation but I really wanted to hear Finch maybe discuss his disorder and the triggers or reasons behind it happening. Although perhaps because he could never share his worries with anyone, it was hard for him to grasp it as well. I just was left unsatisfied at the end because I had so many unanswered questions. The ending was heartbreaking and very unexpected. It's definitely not an easy read but I don't want to say anything more because this is something that should probably be read without prior knowledge. The ending was definitely the highlight of the novel though, and I was left breathless. Riding down from that high though, I don't think it was as spectacular as what everyone said it would be. I really appreciate Niven for delving into an area that is rarely addressed in YA books, and bringing light to the seriousness of the issue and how it should be dealt with. However, I don't exactly think it was executed in the best way. It was a great read with a strong message, but I'm glad I gave myself time to mull over it to discover what I did and didn't like. It also didn't help that I had just finished a stronger read before this, with a lot of philosophical aspects, so I guess this just seemed a little smaller on the scale. I do think you should read it though because I guess there's a reason why everyone else seems to love it! I learned that there is good in this world, if you look hard enough for it. I learned that not everyone is disappointing, including me.